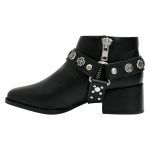 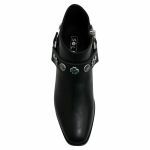 Eddie Western by Sol Sana is a funky heeled ankle boot. 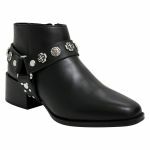 You would wear Eddie Western as an everyday essential to make any outfit pop. Cecile has a silver charm adorned stirrup belt that crosses over the instep, back of heel and underfoot. 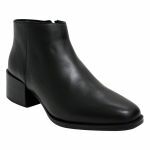 Eddie Western has a square shaped toe giving this western inspired boot a modern look. 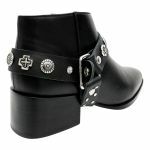 Eddie Western has an inner ankle zipper hidden under the leather stirrup belt. 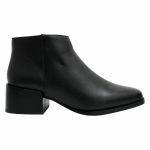 Eddie Weste has a padded footbed for lasting comfort throughout the day and a med block heel for height but also comfort. Eddie Western is made from a soft but durable leather that will eventually mould to the shape of your foot.